"What do you do when you realize you might not be the good guy?" Apparently, the outrage in the fandom has reached the ears of the Powers That Be in ways I never thought possible. When ratings dip and once-enthusiastic fans grow cold shoulders, I guess you have to listen or risk losing your jobs. Bellamy has made many bad decisions this season in the name of protecting his sister Octavia, but in 'Fallen' we finally see a good decision where he leads Pike into a trap and hands him over to the Grounders. Kane feels the need to accompany the Grounders and Pike to Polis, but before he leaves, he asks Bellamy, "Did you do it because it was the right thing or to save your sister?" Bellamy hesitates before saying flippantly, "You're welcome," in an attempt to end the conversation, but Kane grabs his arm and says intently, "It matters. Until you figure that out, you'll be lost." It was such an unexpectedly good line from a show that's been rapidly descending in my esteem that my mouth actually fell open. I thought, could this be a turning point? Will the next episode live up to this one? In 'Nevermore,' we see some beautiful moments for several characters I'd nearly given up on. 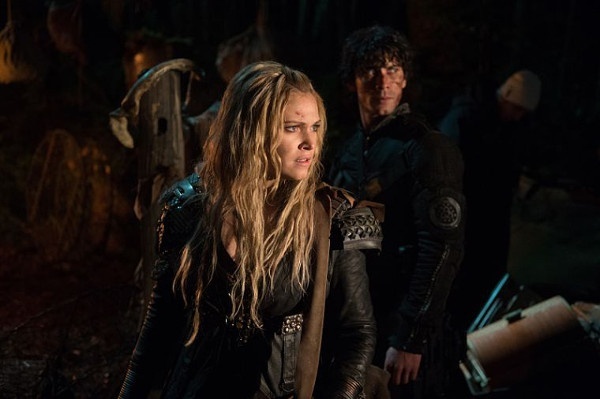 Jasper is downright heroic for the first time in…oh, fifteen episodes, we see Sinclair caring deeply for Raven, we see Monty killing his mom to save Octavia, we see Clarke and Bellamy having some tender moments (boy, did we fans need that) and we had an excellent exchange between Clarke and Niylah. "I'm sorry I lied to you about Bellamy," Clarke tells her as they're preparing to leave the trading post. "You wouldn't have helped us if you knew." Niylah calmly responds, "You didn't give either of us the chance to find out. Let me tell you - if this show keeps delivering like this, it may find a strong fan in me again (at least until the next time it slides downhill). Granted, there were still a few scattered, 'we're trying very hard to be Game of Thrones and still retain our fanbase' moments (such as when Ontari coaxes a chained Murphy into sexytimes), but overall, the last two episodes showed me why I ever loved the show in the first place. It gave us complex questions, questionable decisions, three-dimensional characters, and actual, cohesive plot development for the first time in what feels like forever. I, for one, am excited to see if the show keeps climbing back up toward previous heights. Did you catch the last two episodes? Are you excited for the next horror-themed episode (and do you want to bet it's just Roan and his men pranking the kids? Okay, so that won't be what's happening, but it's funny to think about)? IS THE MUTANT WE SAW IN SEASON ONE RETURNING?